One of the most controversial elements in the annual reenactment of the Moore’s Ford Bridge quadruple lynching that occurred in 1946 in Georgia is a tiny doll. One of the women in the reenactment carries it under her clothing. In Monroe, Georgia, many local black residents believe that one of the victims was seven months pregnant and a Klansman disemboweled her to remove the fetus, held it in his hands and then smashed it to death. In the climatic moments of the annual reenactment, the actor portraying the Klansman rips out the doll, covered in red to simulate blood, and holds it aloft. The reenactment is chronicled in Always in Season, an exceptional documentary in every respect by Jacqueline Olive in her directorial debut for a feature-length film. The film premiered at Sundance this year. 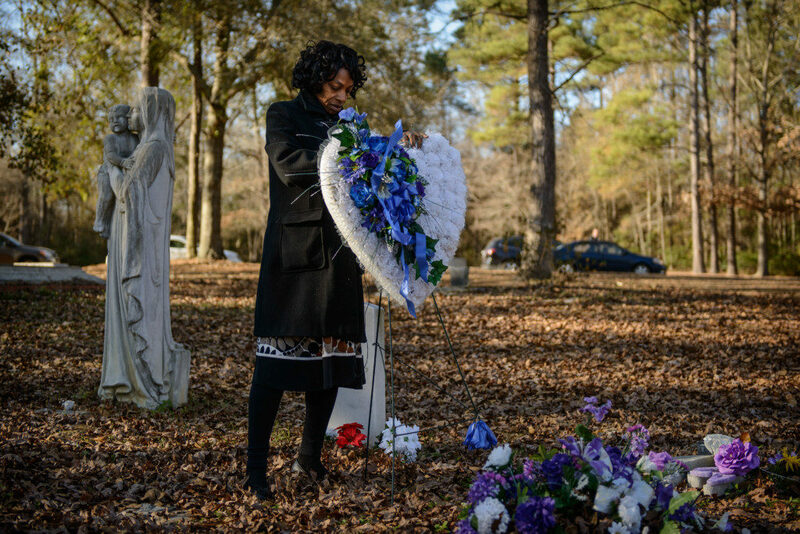 Claudia Lacy cleans up the flowers at the grave of her son, Lennon Lacy, Sunday, Dec. 14, 2014, at Old Shaw-Lacy Field Cemetery in Bladenboro, N.C. Lennon Lacy, a 17-year-old black teenager, was found dead on Aug. 29, 2014, hanging from a swing set in a trailer park in the rural community. 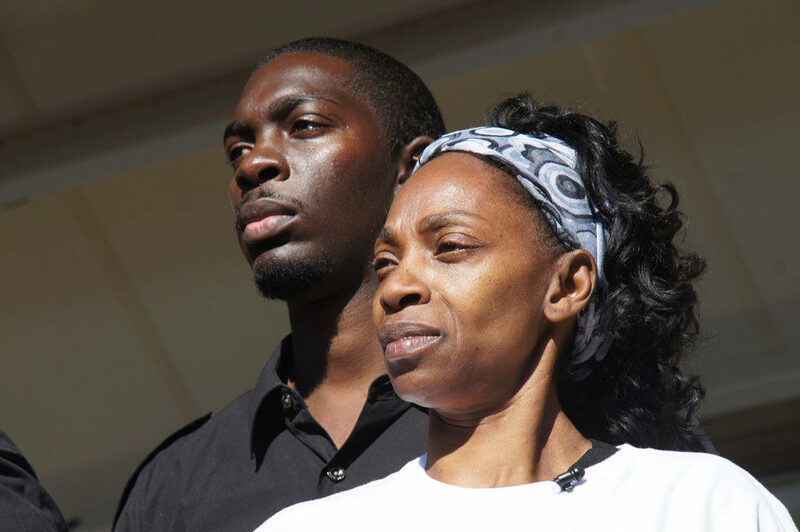 Police ruled the death a suicide, but his family believe it was murder. Olive sets forth on a path that leads to epiphanies that tie together two specific events, separated by seven decades. While the reenactment is the centerpiece of her excellent, concise account about the long history of lynching in the U.S., she also contextualizes it against the August 29, 2014 lynching of a young teen in Bladenboro, North Carolina, whose death was ruled a suicide. Lennon Lacy, 17, who played on his high school football team, was found near his home, hanging from a swing set in a trailer park. The family, convinced that authorities were wrong in classifying the teen’s death as a suicide, was able to get the FBI to investigate, which was supported by the NAACP’s state chapter. The FBI’s investigation was inconclusive and the U.S. attorney’s office in North Carolina’s eastern district announced that no federal criminal civil rights charges would be pursued. Olive explores the case without the explicit purpose of attempting to resolve it but the material she uses in this instance is poised toward the search for that longer arc of justice. She interviews surviving family members, including the mother (Claudia) and Lennon’s brother (Pierre). There are some inexplicable details. Lacy’s body was found without a new pair of athletic shoes that he had just bought. In their place was a pair of white sneakers that were unfamiliar to his family. Lacy also had been seeing Michelle Brimhall, an older white woman who lived in the neighborhood. Brimhall is interviewed in the film. She does not believe that he took his own life and that perhaps there may have been underlying hostilities in the area about seeing a mixed-race couple in public. Regrettably, it seems that no witness can provide details that would clarify the case. There is no statute of limitations on a murder case. There have been many instances where cold cases are reopened after many years. Hence, the 1946 case at the heart of the annual reenactment in Monroe, Georgia. The four victims (Roger and Dorothy Malcom and George and Mae Murray Dorsey) were field hands when they were killed. Investigators examined several motives for the lynching. One was believed to be retaliation for Malcom’s scuffle with a white farmer just days before the lynching. But, there also were reasons to believe the lynching was intended to signal a threat to blacks in the community, after a federal court case ruled in favor of the plaintiffs who had argued that the black vote had been suppressed in Georgia’s primary election. However, after the case had been reopened the state’s investigative bureau closed the case without any resolution, as had the FBI. There were believed to be at least two dozen white men who participated in the killings and the agency believed that none of the known suspects were still alive. In the reenactment, which draws scores of residents from the community located some 50 miles east of Atlanta, there are spectators of all ages, black and white. The irony is instructive and shuddering at the same time, given that many photos of lynchings (which are shown in the film) included large crowds compacted into a relatively small area. Those photos show many families, including children – images that confound and astonish simultaneously. Historical reenactments are widespread for different purposes, most that are entertaining for amateur history buffs. But, few are rarely as provocative in terms of recovering traumatic memories, as in the Moore’s Ford Bridge reenactment. Some scholars and professional historians have a distaste for reenactments, as they critique their factual quality and accuracy. Olive, however, responds in the most persuasive and legitimate manner. 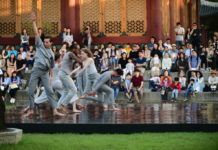 Whatever truths that arise from the reenactment do so as the actors work with both the body of archived details and evidence and the memory of racial trauma, as well as the ongoing acknowledgment that racial violence persists to this day, especially with the noose’s recent return as a menacing symbol. Hence, we come back to the instance of the doll in the reenactment, which brings to bear the emotional rush of violence perpetrated by the Klansmen and the ensuing suffering of the victims. Olive draws us to the visceral, intimate, disturbing and strangely seductive position as observer in these scenes of the reenactment. Suddenly, the victims of the 1946 lynching are etched in our minds, just as the memory of Lennon Lacy, who died three generations later, is awakened in Always in Season. Poetic, delicate yet demanding, profoundly astute, and tightly paced throughout, the film invites us, even if we are unwilling, to move into and experience the sphere of our country’s greatest and unresolved nightmare. Only then will the ground be ready for truth and reconciliation for the history of racial terrorism that has encompassed the whole of the U.S. existence. One screening remains for the film: Feb 2 at noon in Park City’s Temple Theatre. Always in Season also received a Utah Film Center fiscal sponsorship. A former member of the production team for PBS’ Independent Lens series, Olive was a Sundance Documentary Edit & Story Lab Fellow in 2017, as well as a Sundance Documentary Fund Program and Sundance Music & Sound Design Lab fellow in 2018. Actor Danny Glover also is featured in the film, as he delivers the documented evidence of the invitation to the lynching of Claude Neal, which took place in 1934. Olive is creating an accompanying virtual reality project that uses 360° video and computer-generated imagery (CGI) animation to explore the film’s themes and bring the observer even closer into the sphere of the impact of racial violence and the scars of the trauma associated with it. history of lynching in the U.S.